Yamaha professional flugelhorns have the classic design of vertical valve tubing. 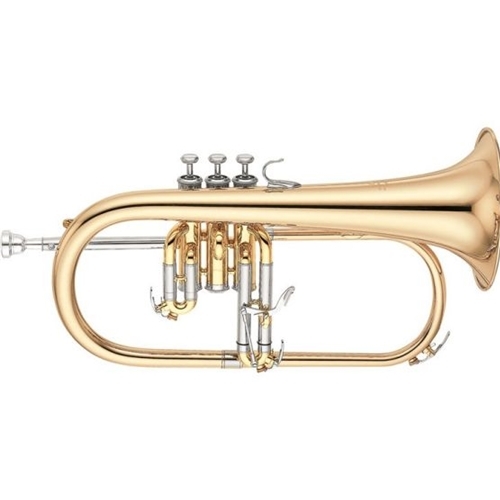 Hand-lapped valves and slides provide a precise fit and smooth flow of air through the horn. The movable mouthpiece receiver ensures easy tuning. The monel pistons are corrosion-proof and long lasting. The 631G is the traditional Yamaha flugelhorn used by many of the world's leading musicians. The tone is characterized by an extremely round, mellow sound with an abundance of tonal color. It features a gold-brass bell for a soft dark sound and a beautiful lacquer finish. Features: Vertical valve tubing: Traditionally, flugelhorns are made with vertical valve tubing. Monel pistons: Monel pistons are resistant to corrosion and are an ideal choice for professional flugelhorn pistons which must retain precise precise fit and smooth action over many years. Hand-lapped pistons and slides: Hand-lapped pistons and slides ensures an absolutely perfect fit and seal between the pistons and casing or slide parts. Such a perfect fit helps achieve smooth air flow and smooth action and improve the response and intonation of the instrument. Movable mouthpiece receiver: Tuning is made easier with the movable mouthpiece receiver. Pressure formed tubing: Perfectly rounded tubing results in less turbulence and a smoother airflow, thus allowing for an excellent scale and reduced resistance. Laser-fused pluzuma welded bell: A high-energy laser fuses the brass together for a virtually seamless bell which allows continuous even vibrations. Third valve slide trigger assembly: A third valve slide trigger assembly (YAC YFTR) is standard.